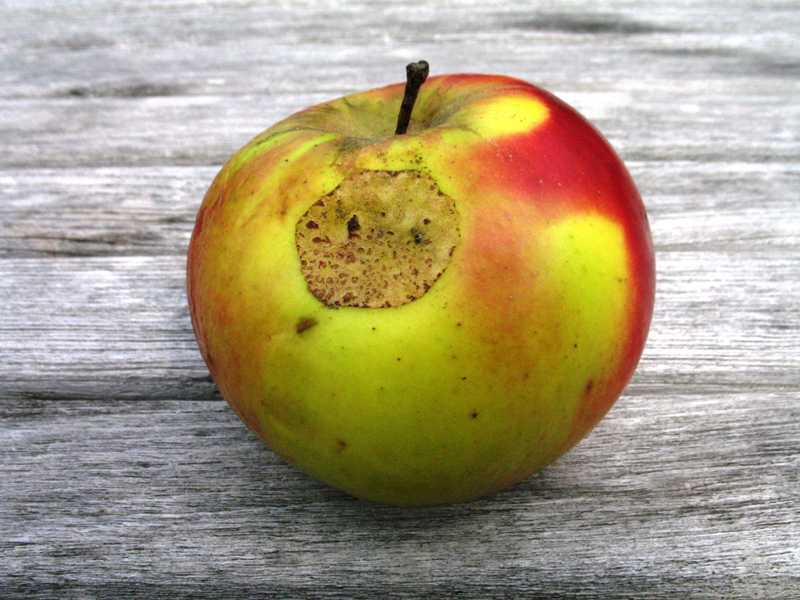 Apple scab is caused by the fungus Venturia inaequalis. 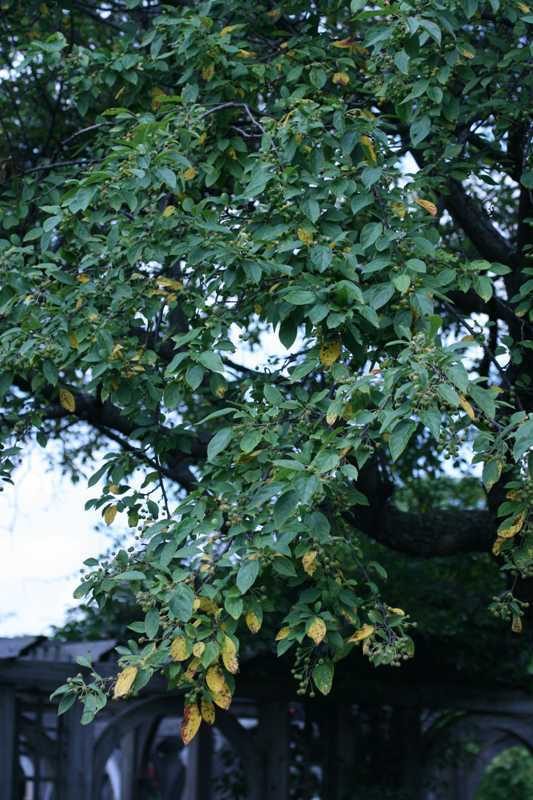 It is common on susceptible apples and crabapples in Missouri and causes leaves to yellow and drop prematurely in midsummer. 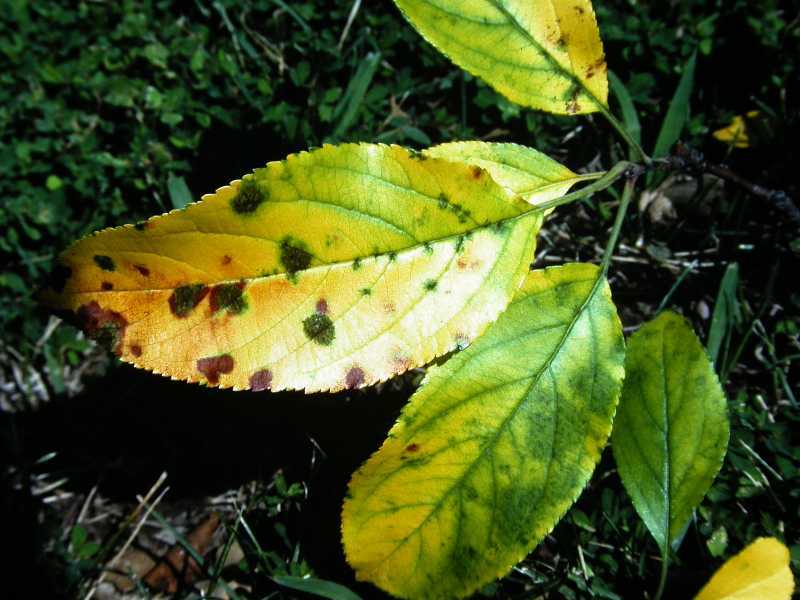 In years with moist and cool spring weather, infection can cause widespread defoliation. In spite of severe leaf drop, apple scab rarely kills a tree. If severe defoliation occurs for several years the tree could be weakened, making it vulnerable to other problems. Scab can cause cosmetic blemishes on the fruit. Fruit with apple scab is still edible. Apple scab can also infect hawthorn and firethorn. The first signs of apple scab often are not noticed. These signs include twisted and puckered leaves that have black, circular scabby spots on the underside. On the upper surface the spots look velvety and have an olive-green, sooty appearance. The spots may fuse and cover the whole leaf. 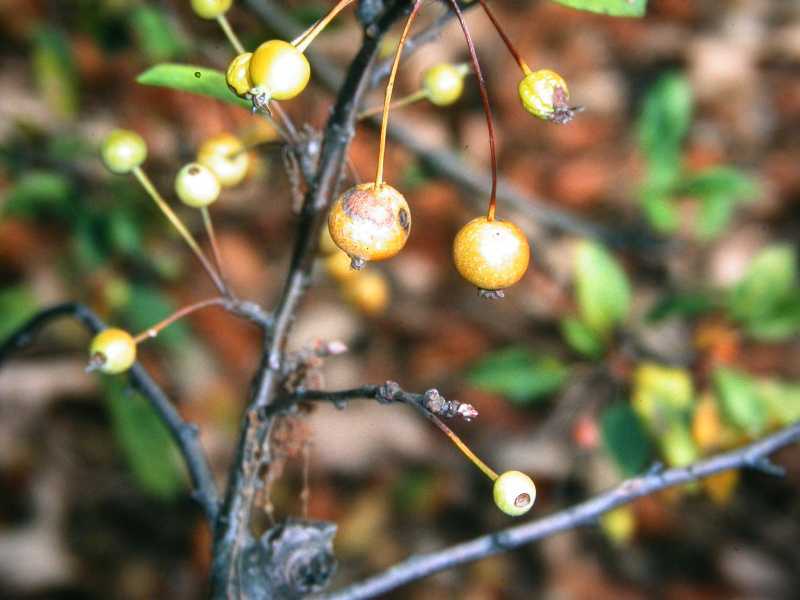 As the disease progresses, the leaves yellow and drop. The fruit develops scabby spots that are tan and sunken. Apple scab may be confused with cedar-apple rust, also a fungal disease. Cedar-apple rust can also cause yellowing leaves, but the spots are bright yellow with a dark center of black fruiting bodies. Fungal spores overwinter on infected fallen leaves and fruit. Spring wind and rains carry the spores on to the young leaves. Cool, moist springs favor infection. Ten to twenty days after infection, new spores are released which infect new leaves. These secondary infections can continue throughout the summer until conditions become too hot and dry. Wet leaves are needed for the fungal spores to germinate and infect the leaf. 1. Live with the disease. 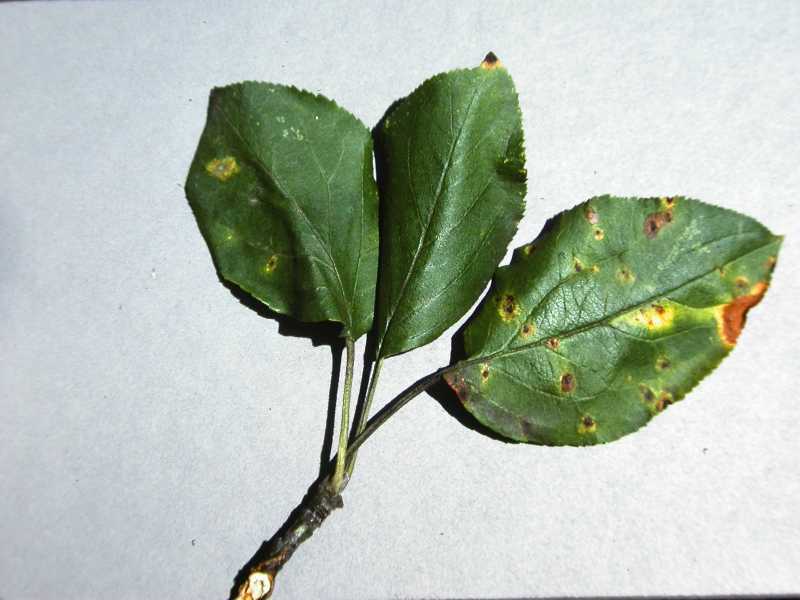 Apple scab rarely kills trees and the severity of infection will vary from year to year depending upon climatic conditions. Give more attention to young trees that may not establish well if prematurely defoliated. Also take note of any trees that become weakened through several years of defoliation and act accordingly. 2. Keep plants healthy. A tree that is watered during dry periods will be better able to withstand periodic defoliation. 3. Clean up and destroy infected leaves. The fungus overwinters on infected leaves; therefore, it is important to rake up and destroy leaves in the fall. Since the spores also travel on the wind, cleaning up leaves may be only partially effective. 4. Prune trees to allow good air circulation. Allowing for better air movement will allow leaves to dry more quickly and help prevent infection from occurring. Do not use overhead watering. 5. Apply fungicidal sprays to susceptible trees if clean foliage is necessary or if defoliation reduces fruiting on eating apples. sulfur can be used but it must be applied before the fungal spores germinate. Chemicals registered for use include chlorothalonil (Daconil), copper, ferbam, fosetyl- Al, mancozeb, maneb, thiram, triflumizole, and ziram. Fungicidal sprays must be applied before infection as a preventive to be effective. 6. Replace the tree with a variety resistant to apple scab. Resistant varieties of eating apples include: ‘Florina’, ‘Freedom’, ‘Gavin’, ‘Jonafree’, ‘Liberty’, ‘Macfree’, ‘Nova Easygro’, ‘Novamac’, ‘Priam’, ‘Prima’, ‘Priscilla’, ‘Redfree’, and ‘Sir Prize’. Many resistant crabapple varieties are available at nurseries and garden centers or through mail order sources. Strategies 1, 2, 3, 4, and 6 are organic approaches. Of the fungicides listed in Strategy 5, consult the Organic Materials Review Institute (OMRI™) for appropriate organic copper products.